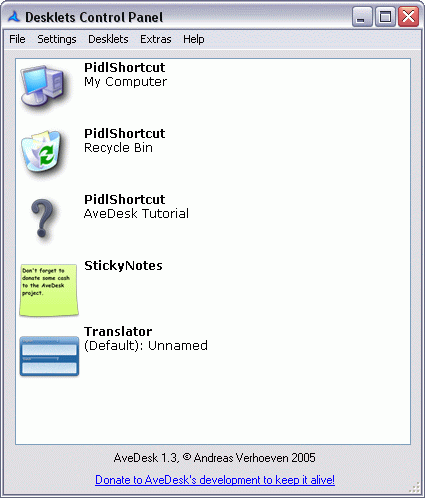 AveDesk is a program that will give you the ability to have icons on your desktop that update themselves. Each icon is in fact a "desklet," or a plug-in that can provide a variety of functions. A desklet can be just a regular shortcut, a mail checker, a calendar, a clock, etc. depending on the desklets programmer. Features a wealth of customization options for displaying desklets. Dependencies: Pre-WinXP systems will need GDIPLUS.DLL in the application folder. Better support for mini-applications / widgets / desklet. Hardware accelerated flip and closing effects. Unique library of skinned, alpha-blended controls. Unique Control Panel for managing desklets. ShowCase adds an extra level on top of your desktop. and it seems that the latest version is 1.4 as Emka has mentioned above.